Success is a team play and great achievements are possible just through cooperation and trust. I strongly believe in this statement and I keep on repeating it like it were a mantra. Today I would like to focus specifically on the part about trust. Let's pretend not to be in a big city in the middle of the twenty-first century, but in the middle of a wild jungle some thousand years ago. We are part of a tribe of hunters where farming and agriculture have not yet been adequately developed. Our hunting area is dangerously depleting and the lack of animal proteins is putting at risk the survival of our clan. The only possible solution consists in an enlargement of our territory and a group of hunters, of which you are a part, will be forced to explore new areas, going well beyond the boundaries within which our tribe has lived until now. How do you feel about that? Please, write on a piece of paper which are the three things you worry about most. Even if there are no rules and different people react differently to the same stimuli, chances are that in your list you have included, in the first positions, your beloved ones. Your children, your partner, your parents, especially if they are elders...in essence all the people that count on your presence and your care. In the end you would take part to the expedition just the same, knowing that a failure could put at stake the entire clan survival, but probably you would not be able to commit at 100%. Too heavy would be the burden, to heavy knowing that someone you love could be negatively affected by your death. Probably all your team mates will experiment the same concerns and this could seriously jeopardize your mission and your tribe’s survival. This will be the outcome if you cannot trust that your community will take good care of the people you love the most. Because if you know that someone is going to help them in case something terrible will happen to you, if you know that they won’t be left alone, if you know that your clan will take good care of them...then you will be able to accomplish extraordinary deeds...and probably you will be destined to great achievements. Obviously not everyone survive the process. Casualties occur along the way. The bottom line is to have a team whose value is at least equal to the values of its members. A trustful environment allow to follow the difficult path towards evolution, this was true 6000 years ago in the middle of a wild and hostile environment as today in our polished and sparkling towns. It could be objected that do exist subjects that do not conform to this behaviors. There are individuals that take giant risks without safety net (behavior leading sometimes to great evolutionary leaps) or that don't think to themselves as part of a community. That is true, but it is also true that you cannot rely on those behaviors because they are normally unpredictable and not sustainable in the long run. Projects are quite similar. If you nurture a trustful environment then your team mates will be capable to achieve extraordinary results, because they will be eager to take the extra risks that sometimes are required by evolution. They will try their best, because they will feel protected and supported, and you could count on a team whose value is greater than the values of its members. Because they will know that no one will be left behind. No matter what. This is the first time that I publish on this blog a post not written by myself, and I am very pleased that it is a post published by a friend of mine, Alison Wood from Knowledge Train. 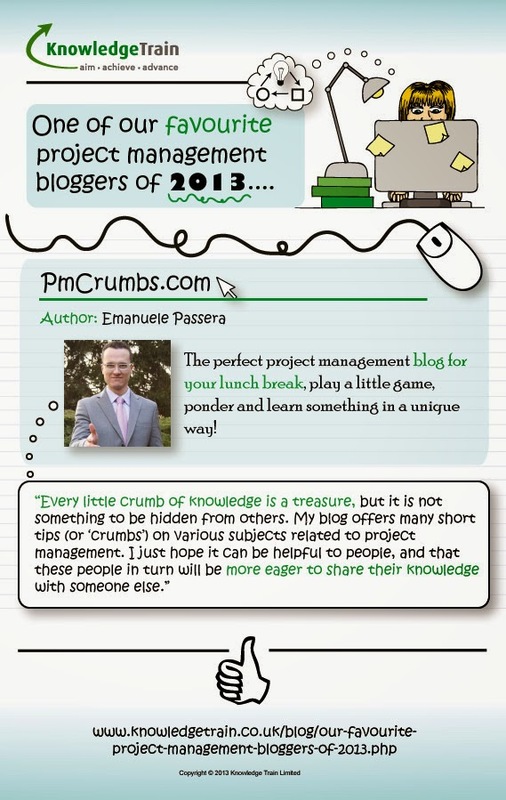 It is an interesting collection of blogs on project management and I am pleased that Alison had included pmcrumbs in the list. I guess you will have a very good time reading the full article.